Once stamped I spritzed my card with water and applied some Broken China Distress Paint to my mat and watered it down a little. Then with a wide brush I stippled the colour onto the background. 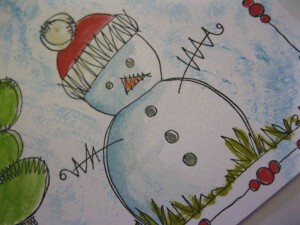 As the card is wet, it softens and disperses the paint to give you a snowy sky. My trees are actually the bauble stamps off the set – but I thought they would make fabulous trees instead for this card! 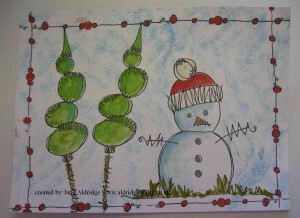 This set also has a couple of fun zentangle like borders too.